Yes, there is a 'Jenifa' in you and I am still very much sane OK? Have you seen Jenifa? I know most of you have. Well if you haven't, I'll give a short summary. 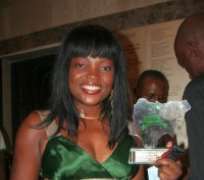 OK, there's dis chic (Funke Akindele) who is from the village but is about to attend the university in Lagos. So she gets there and changes her name from Suliat to Jenifa and tries to be a 'bigs gal'. Anyways, she tries so hard to fit in by sleeping around and she ends up with AIDS and becomes an HIV advocate. OK, I know i gave a poor narrative but really the movie is amazing. Seriously, I am not a fan of Nigerian movies, talk less of a Yoruba movie but it starred Bisi from I Need To Know and she looked so cute, so I just had to watch and I LOVED IT! But that's not the issue. My point is the movie revealed something to me. Something all thou judgemental critics will never see. That there is a Jenifa in every one of us. Let me make my point clearer now for the benefit of your understanding. Look at that closely and I am sure it reminds you of someone. YOU! YES...YOU!!! Now, most of us humans want to fit in... We want to fit in... roll with the cool crowd...be in good terms with out family members... we want to fit in with our friends...we want to SO BADLY BE A PART OF SOMETHING. Now, you can be annoyed at this point and refuse to accept that Jenifa in you. Well, if there is anything I have learnt in this my short time in life...it is to be real. The greatest point of an individuals life is a point where they accept who they are. If you are 60 years old and you have not accepted yourself, you have not started living. If you don't love yourself, if you don't fit in with yourself...It is not so good. God says...Love your neighbour as YOURSELF. This means you cannot love someone else if you don't love GOD and yourself first.